This is a perfect side dish for Thanksgiving or any time of the year. 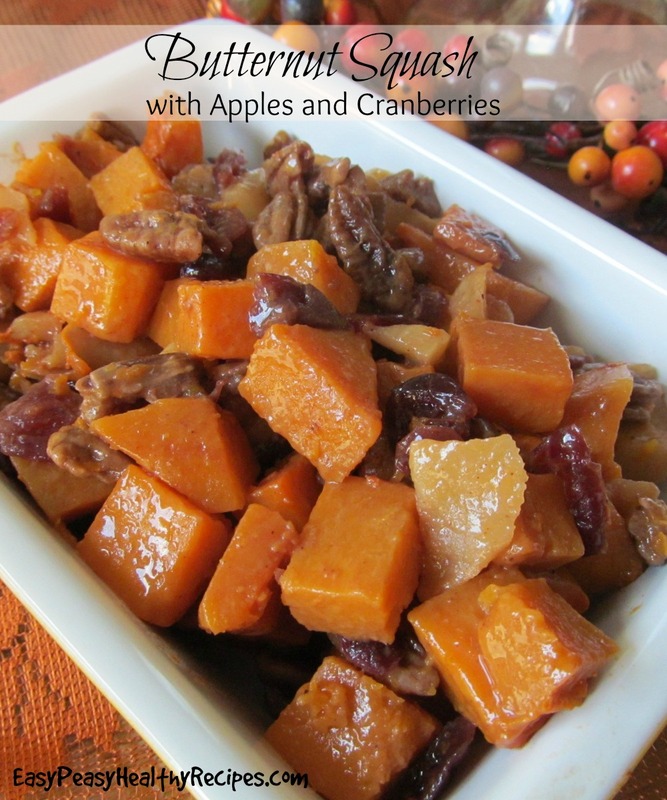 The flavors of the squash, apples, pecans and dried cranberries combine so well together. This dish is also packed with healthy vitamins and nutrients. Naturally low in fat, butternut squash delivers an ample dose of dietary fiber, making it an exceptionally heart-friendly choice. It provides significant amounts of potassium, important for bone health, and vitamin B6, essential for the proper functioning of both the nervous and immune systems. The folate content adds yet another boost to its heart-healthy reputation and helps guard against brain and spinal-cord-related birth defects such as spina bifida. As if this weren't enough, butternut squash may have anti-inflammatory effects because of its high antioxidant content. Incorporating more of this hearty winter staple into your diet could help reduce risk of inflammation-related disorders such as rheumatoid arthritis and asthma. Here are the healthy ingredients needed to make this dish: butternut squash, dried cranberries, apple, pecans, cinnamon, nutmeg. Also butter and a little brown sugar that is not pictured. First start by splitting the butternut squash in half and scooping out the seeds. Peel that tough outer skin off and diced squash into 1/2 inch cubes. Spray a baking dish with non-stick cooking spray. Combine the squash, diced apple, dried cranberries, pecans, melted butter, cinnamon, and nutmeg together in the baking dish. Cover and bake at 350 degrees. 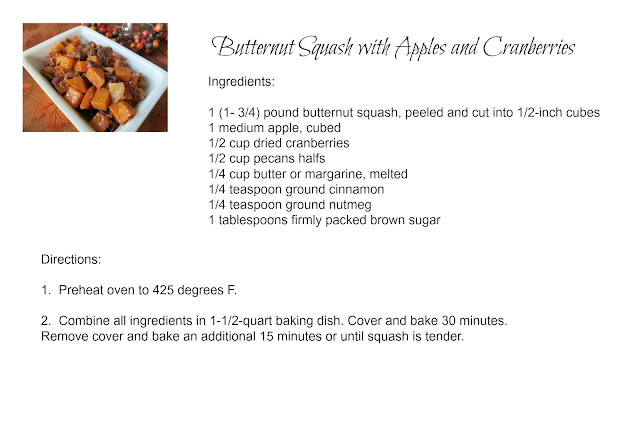 Remove cover and bake an additional 15 minutes or until squash is tender. Here is a yummy no-guilt cookie recipe that is packed with wholesome healthy ingredients. They are really quick and easy to make with only a few ingredients required. And with no added sugar they have just the right amount of natural sweetness to make them delicious. 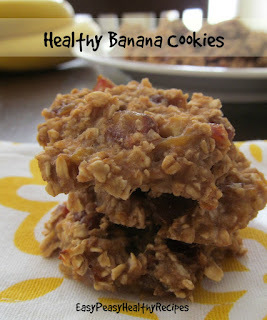 The cookies are soft and healthy enough to eat for breakfast or a snack on the go. 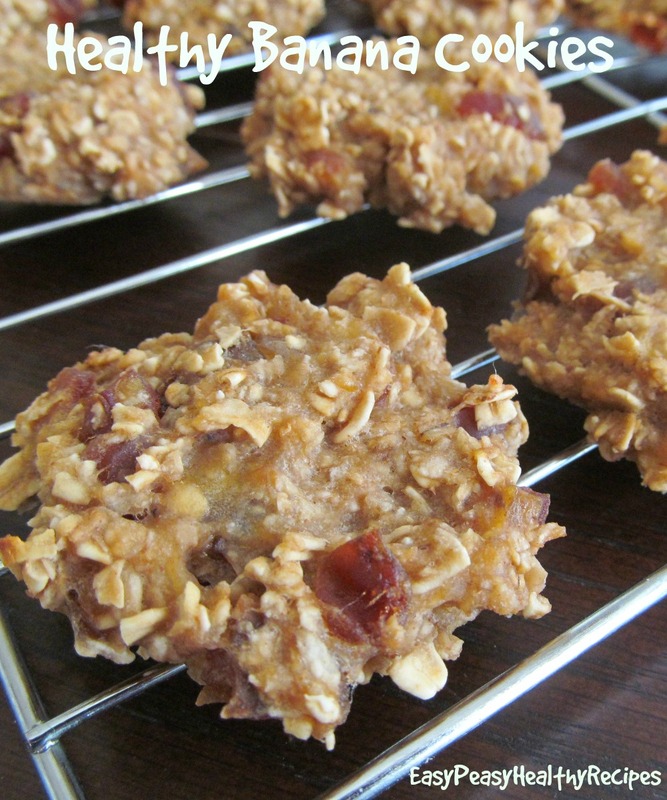 So go ahead and make up a batch of these cookies that you can eat with no-guilt! 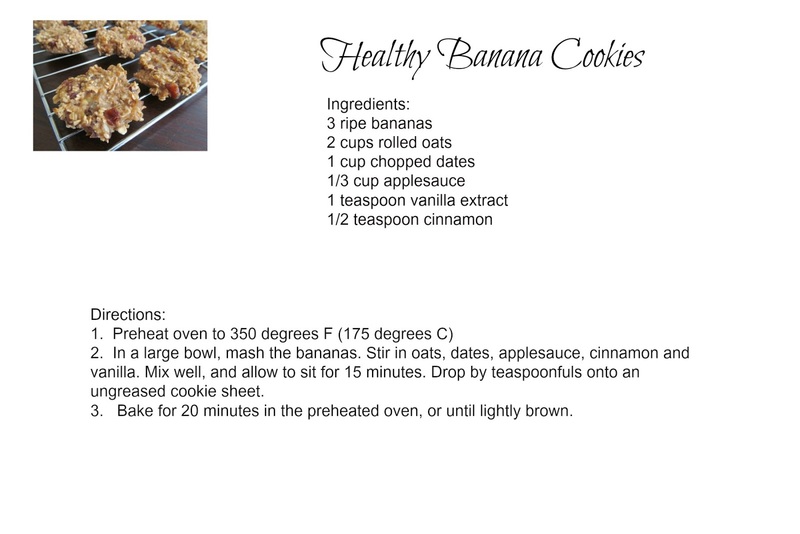 Just a few ingredients are needed to make these yummy cookies: bananas, oats, applesauce, dates, cinnamon and vanilla. I have also made these before with dried cranberries in place of the dates and they are good too. In a medium bowl, mash the bananas. Combine the oats, chopped dates, applesauce, cinnamon, and vanilla. Stir this until well combined. Drop by teaspoonfuls on a parchment lined baking sheet. Bake at 350 degrees for 20 minutes or until lightly browned. 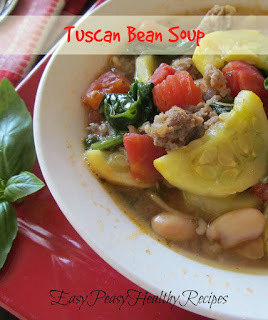 I love this hearty soup full of fresh veggies. 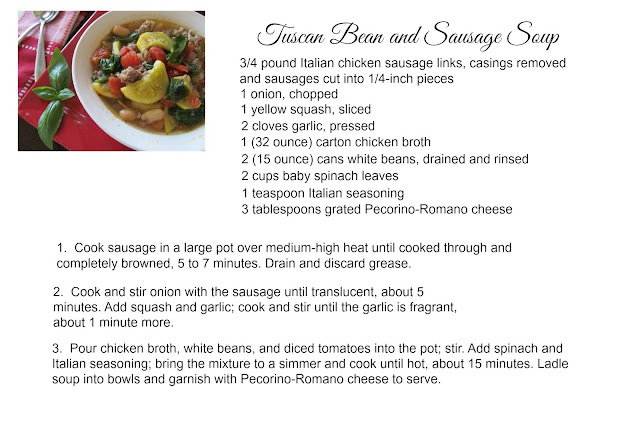 When you need to have dinner on the table in a hurry this is a great go-to recipe. It is very quick to make and so comforting. I sometimes make this with kale in place of spinach. I love the addition of yellow squash in this soup but it could also be substituted with zucchini. This is easy peasy to make and delicious too! Hope you enjoy!